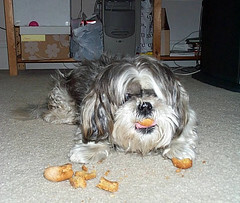 Itchmo: News For Dogs & Cats » Blog Archive » Mine… All Mine. Don’t worry… I’ll clean up all the crumbs. This entry was posted on Monday, May 14th, 2007 at 3:53 am	and is filed under Dogs, National Dog, Cat & Pet Info, Art & Pictures of Cats & Dogs, Entertainment About Pets. You can follow any responses to this entry through the RSS 2.0 feed. Both comments and pings are currently closed. Ah yes, now that it is broken into pieces it should all fit in my mouth at once!